22-Oct-2016 -- I began this attempt the same way as the previous visitors, by taking King Road eastwards - through the Kofa National Wildlife Refuge - from highway 95 (at 33.26713°N 114.23897°W). After about an hour of driving (as the road got increasingly rough), I arrived at the end of the road (at 33.06363°N 113.95856°W, 5 miles (as the crow flies) north-east of the point). At this point, the road is closed to motor vehicles - but not (to my knowledge) to mountain bikes. So my plan was to continue south from here on my mountain bike - about 4 miles - to near the 33 degree North line, then continue riding westward along flat washes to get to the point. This seemed a lot easier and faster than hiking - if I could pull it off. In more than 100 degree Fahrenheit temperatures, I started riding south, continuing along the road (now called “Wellton-Kofa Road”. I was feeling good, until - about 2.5 miles along - I encountered a large “No Trespassing” sign. 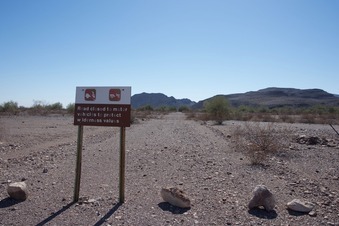 Apparently I’d reached the border of the U.S. Army’s “Yuma Proving Ground”. Trespassing in U.S. military territory did not seem a good idea, so I was forced to turn back - 3.72 miles from the point. Because it was getting late in the day (and still very hot), I decided not to try to attempt an alternative route on foot. Instead, I’ll return some other time (perhaps in the winter) to attempt to reach this point via another route. Looking at satellite imagery, I have figured that a possible alternative route would be to park a bit farther west - at 33.06480°W 113.97230°W - and start hiking south from there. This route should pass through a series of washes (so involve relatively little climbing).